A few Sundays ago, I introduced the book of Revelation by noting that this book is a witness, a reporting, of a vision. While in prison on the island of Patmos, John has a vision that pulls the curtain back, to give us a look ‘behind the scenes,’ so to speak. His vision shows us what is really going on in the world and who, really, is in charge, and how. And now, in our reading this morning, John’s vision takes him into the heavenly throne room. What he sees there is God holding a scroll. Opening the scroll will lead to the fulfillment of God’s intentions for this world. And for those who have already read to the end of the story in Revelation, we know what that intended future is: no more tears, no more violence, no more hunger or poverty, no more suffering, sickness, or disease, and all people and all creation living together in peace. The question is: how will we get there? Or, in terms of this vision: who has the authority to open the scroll? At first, no one can be found to open the scroll. No one can be found, that is, who can bring God’s intended future into being. And so John begins to weep. Tears often flow when there seems to be no way. Who would you want to oversee the events leading to God’s intended future? Who can defeat all the evil in the universe? I imagine these elders around the throne interviewing all the possible candidates. Like we tend to do, they’re going to be looking for someone powerful. Someone good, yes, but also someone who is powerful. Maybe someone like the Avengers, or Superman, or Ironman. One of the elders says to John, “Do not weep. See, the Lion of the tribe of Judah, the root of David, has conquered, so that he can open the scroll. That sounds good. A lion sounds powerful; root of David sounds biblical. Let’s interview that guy. So John turns around, and what does he see standing there but…a sheep! And it’s not just any sheep, but a sheep that’s been slaughtered. And not even a sheep, really, but a weak, gentle, little lamb. And then the lamb takes the scroll from God. The Lion of Judah is never heard from again, probably because it’s a title ripe with misunderstanding. From now on, Jesus is referred to as the lambkin: 28 times in the Book of Revelation. 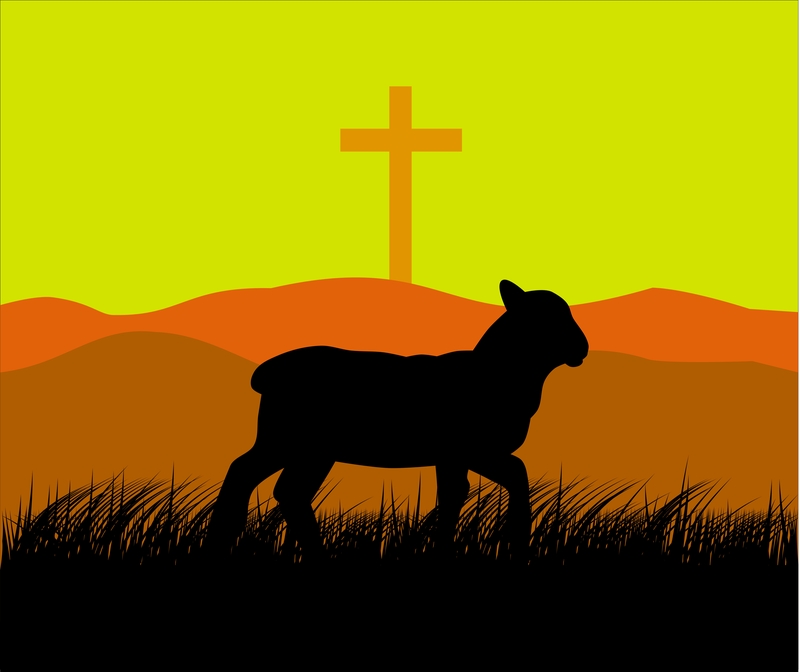 ‘The lamb who was slaughtered’ is Jesus’s primary title in the book. Jesus, the slaughtered lamb, is the one who will oversee all the difficulty, suffering, violence, poverty and who will see to it that God’s intended future finally comes. And how will the lambkin do that? What is the lambkin’s special super-power? It turns out, that lamb power is the power of self-giving love. Lamb power is the power of forgiveness, even of enemies. Lamb power is the power of compassion. This is the power that can see us through all the difficulties of this world until God’s promised future comes. And it is the power that can bring that future to us. The lambkin who is slaughtered but standing is of course the crucified and risen Jesus. John’s good news for us this morning is that this slaughtered but standing Jesus is reigning right now. And reigning not only in heaven but right now overseeing all things until the end when they are redeemed. The slaughtered but standing Jesus is in the midst of violence, standing with us. The slaughtered but standing Jesus is in the midst of hunger and poverty, standing with us. The slaughtered but standing Jesus is in the hospital room and in the prison cell, standing with us – Bringing healing where we are held captive to sin, bringing light where we dwell in darkness, bringing life where there is death, bringing forgiveness where there is guilt, bringing love where there is hatred. Bringing lamb-power. And the response is praise from all. A representation of everyone in all creation is shown praising God and the lamb, because this slaughtered Jesus will oversee the renewing of the whole earth and all that is in it, for his care extends to every man, woman and child, to every living thing, to every tree, every river, lake and ocean: lamb-power will see to it that God’s intended future comes to everyone. And certainly we are called to join their worship and praise, as we do here each week. But our risen Jesus also wants us to understand that our worship won’t be complete until we follow where he leads us – out into all the nooks and crannies of this world. For our worship is not only expressed in the words we say here on Sunday morning, but also in our following of Jesus our Lord during the week. Our Sunday morning worship feeds right into our Monday morning lives. Jesus invites us to follow him, confident that because he oversees all things, we can stand with others in the midst of hunger and poverty and illness, we can stand with others who dwell in darkness or in the shadow of death, we can bring forgiveness where there is guilt, we can bring comfort where there is despair. And so today, we give praise to the lamb who was slain; today, in our worship, we praise Jesus. But let us also go into this week, following Jesus into the nooks and crannies of this world, standing with those who are vulnerable and in need, bringing to the world the good news of Jesus’ redeeming love.